The product has rotating cutting system.Perfect hair removing from nose, ear and eyebrows, detachable cutting head for easy cleaning, water proof cutting system. 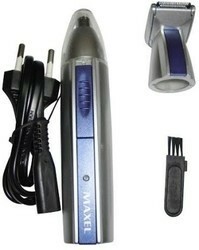 We are a top notch supplier of Nose Ear & Eyebrow Hair Trimmer. Personal grooming nose/ear hair remover. - Make The Skin Smooth And Delicate. No More Irritation, Redness Or Cuts.18K Gold-Plated In Beautiful Rose Gold, Discreet And Portable. - Suitable For Women And Men of All Ages. Easy to Install and Use.